Smaller than a credit card, the diskGO Pocket SSD is one of the smallest portable SSD solutions available. The diskGO™ Pocket USB 3.0 SSD is TAA compliant, built with a premium SandForce controller, and backed by a three-year warranty. Are you in search of a high-capacity USB 3.0 Solid State Drive (SSD) in a discrete design? If so, the diskGO™ Pocket USB 3.0 SSD delivers. Smaller than a credit card, the diskGO Pocket SSD is one of the smallest portable SSD solutions available. Equipped with USB 3.0 - the fastest USB connection - the diskGO Pocket SSD is up to 10x faster than USB 2.0 storage. * USB 3.0 is also backwards compatible with USB 2.0 systems. SSDs have no moving parts and are faster, more rugged, and more efficient than hard drives. The sleek black aluminum exterior provides additional cooling and durability. A powerful SandForce based mSATA SSD drives the diskGO Pocket SSD, providing unparalleled performance. Store HD movies, archive photos, and back up music libraries with lightning fast speeds. 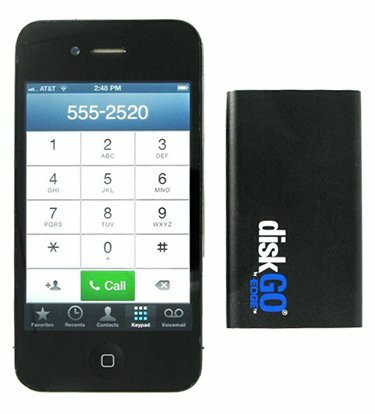 Getting started is easy - simply connect the diskGO Pocket SSD to an available USB port of a computer to begin backing up and transferring files. No software to install or setup required. Also available as a standalone enclosure, the diskGO pocket mSATA enclosure turns an mSATA SSD into a portable storage device. Perfect for users upgrading an Ultrabook to a larger mSATA capacity and have an extra mSATA SSD available. The diskGO Pocket USB 3.0 SSD is USB powered, so no additional power supply is required. This product is backed by a three-year warranty. Pocket-Sized - Smaller than a credit card measuring less than 3" x 2"
Cross Compatible - Works with Windows XP and higher, Mac OS X 10.4 and higher, and Linux systems. Backwards compatible with USB 2.0 and 1.1. Mini screwdriver and USB 3.0 cable included with standalone enclosure product only. 1. 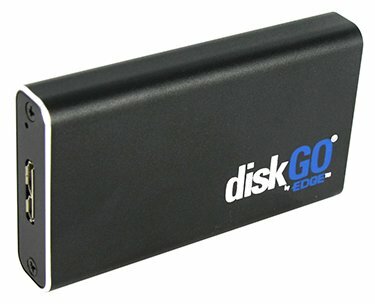 How do I store and access files from my DiskGO Portable SSD using Windows? 2. How do I store and access files from my DiskGO Portable SSD using a Mac? 3. How do I format the DiskGO Portable SSD for use with a Mac? This device is preformatted using the NTFS file system and will initially only be recognized in Windows. In order to use with a Mac, you will first need to format this device using Disk Utility. WARNING: All data will be erased. Back up your files on a Windows computer before formatting. 5) Next to Format, click the dropdown and select Mac OS Extended (Journaled) if you intend to use this device ONLY in a Mac environment. If you wish to use this device in both Windows and Mac environments, select MS-DOS (FAT). NOTE: If you choose to format as FAT, you will be unable to store individual files of 4GB or larger on the DiskGO Portable SSD. 4. What operating systems support DiskGO Portable SSDs? 5. How do I utilize USB 3.0 speeds? 6. I get an error when I disconnect my DiskGO Portable SSD from a Mac. Why does this happen? 7. In Windows, what is the proper way to disconnect my DiskGO Portable SSD after I have finished using? The DiskGO Portable SSD is supported by Windows XP and higher. To disconnect, simply unplug the USB cable when the drive is not active (when the activity light is not blinking).